In part three of our series about college visits, we share questions to ask and tips to make it a memorable day. A Mother’s Confession – My husband and I had a far better time on the college tours than my son did. That may have been because with every question I asked, he sank deeper and deeper into his chair! Even though you may be thrilled about the next stage in your child’s life, don’t be surprised if your student isn’t as motivated as you are about these visits. However, this is the time to ask important questions – for you and for your child. Whether you’re footing the bill, or your student is taking out loans, it’s a costly venture. Don’t be shy about getting as much information as possible. 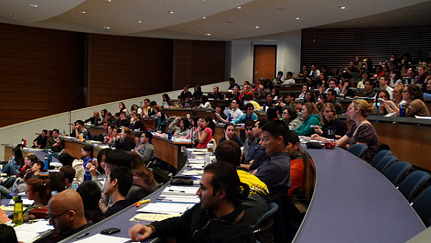 College tours usually begin with a general presentation in a classroom or lecture hall on campus. If your child is not one to appreciate your eager quest for knowledge, tell him or her to sit in the back and pretend they don’t know you. Many of your basic questions will probably be addressed in this presentation. However, I always had to raise my hand. I just couldn’t help myself. Whether it was about campus security, alcohol awareness, support for out-of-state students, or just some question that my son thought was totally lame, I needed answers to calm my parental anxiety. I think it was part of the process of letting go. I never let his embarrassment bother me. I embraced it. After the general presentation, you will be assigned to a tour guide – usually a college student. Depending on how groups are arranged, you could ask for a student with interests similar to those of your child. That way, you can ask specific questions as you walk through campus. The tour will usually hit the highlights of the university – a few specific buildings where classes are held, the university center, the library, the quad or field where students hang out between classes, the bookstore, maybe the recreational center, and finally at least one dorm or dining hall. You won’t see everything the school has to offer on your tour. However, use this opportunity to ask to see things “not” on the tour. For example, if your child is a swimmer, ask to see the pool, or meet with a coach. If your future college student excels in a particular subject, ask if there’s a chance you can meet with teachers or sit in on a class. 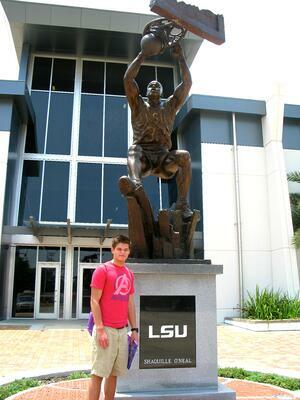 My son was interested in playing club water polo at LSU. He contacted the club's president via e-mail. While we weren’t able to meet with him that day, we were able to visit where they practiced and played - venues not on the scheduled tour. As you walk through campus, take note of the many school publications, flyers, etc. This is great material to review when you are waiting to meet with counselors, financial aid, or while you’re taking a coffee break. It’s also great information to look through when you return home. Charles Basden, Jr., coordinator, special projects, for George Washington University, a member of the NobleHour Network, also suggests looking at local publications near the school, as well as relevant academic publications to gauge how the school's reputation is relative to the greater population in the city. Encourage your son or daughter to actually look at the university students. Do they seem happy and engaged? Are they polite and informative? Give your kids time to speak with students on their own. Interaction with them can provide a wealth of information. 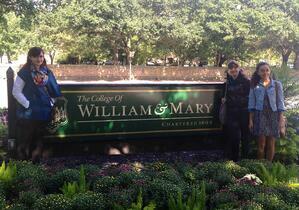 Katie McKnight brought her daughter, Ellie, and two of her friends to visit William & Mary. Once the girls finished their interviews and had lunch, she told them it was time for them to explore - without her! Dr. McKnight is a college professor of secondary education/literacy for National Louis University in Chicago. "I think it's important for students to explore a campus on their own without parents hovering over them at all times. They need to talk to other students, listen to the campus, and observe. 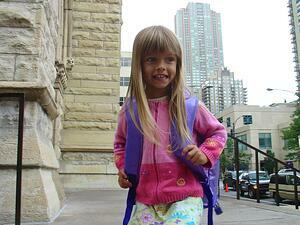 My daughter, not me, needs to decide if a particular college is the right fit." Whether your future college student is excited or not, embrace the day. Yes, it’s about them, but it’s about you too. You’ve put in a long 16-18 years raising this wonderful teenager. Here are a few tips to help you enjoy this occasion. No matter what your teenager says or does, just smile at them with that, “I love you and am so proud of you look.” They can’t compete with that. But, remember, even though it’s exciting, it’s still stressful for them. You could be on your feet for an hour or two depending on the size of the campus. Some larger universities may have shuttles, but you will still need to walk between certain areas. Remember, especially for southern schools – it may be warm and sunny outside, but airconditioning inside can feel like a walk-in cooler. You can freeze just waiting for the presentation to begin. A bottle of water comes in handy when you can’t leave the group to get something to drink. Stash some sunscreen, a hat and even an umbrella in the car. The bookstore usually sells inexpensive rain ponchos if you get caught in a sudden storm. Be prepared for any weather. You spent a lot of money getting there and the tour goes on no matter what. Don’t forget that this is really a wonderful milestone in your child’s life and yours. Take some pictures! “It was good to have that one-on-one time,” said Scalise. “We could really discuss the pros and cons of going away. It helps the kids know what to do and it’s very comforting to the parents as well." Relax. It’s Just A Few Questions! So here’s a sampling of the questions that made my son cringe and move to the back row. 1. How hard is it to get the classes you want? For example, if you need to take specific classes to graduate – are they only offered in the spring? If this is the case, and you can’t get in to the class, it may take you longer to graduate. 2. How big are the classes? Ask different students how many kids are in their largesst class and how many are in their smallest class. 3. What percentages of courses do professors teach versus teaching assistants? It’s normal for some classes or labs to be taught by TA’s, but when you’re shelling out all that tuition money or your child is taking on huge loans, you don’t want all of their classes taught by TA’s. 4. What is the student to professor ratio? 5. Ask about the student population – percentage of males vs. females, locals vs. out-of-state, diversity, etc. 6. What sort of transportation do they offer if your student does not have a car? 7. How many years of on-campus housing are guaranteed? Is it required? 8. When are scholarship deadlines? 9. What is the acceptance rate? 10. What are the school’s campus safety initiatives? What measures do they take regarding safety, weather emergencies, etc.? 11. Do they have an alert system? Many schools now have text alert systems. 12. Ask about the facilities. What types of services do they offer – health center, recreation center, counseling, etc.? 13. Do they require alcohol/drug awareness seminars? 14. Do they offer career services? 15. What will be the return on investment by going to your school? My last tip – when the tour is over, have your teenager remove her headphones and do your best to engage her in a conversation about what she liked and didn't like. McKnight's daughter surprised her. Despite their visits to Dartmouth, Emory, and William & Mary, Ellie decided to attend Brandeis University, a school they did not visit until she was admitted and had already accepted the offer. 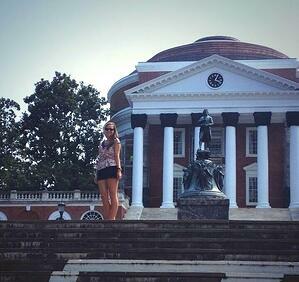 McKnight asked Ellie if she was sure she wanted to accept before visiting the campus. "Yes," said Ellie. "I've been researching, visiting, and learning about colleges for the last year. I know what I want and even though I haven't visited Brandeis, it has what I want." McKnight doesn't think her daughter would've been so resolute in committing to a college she had not visited if she hadn't already been on a tour. "College is about furthering one's individual identity and I think the visit is one of those first opportunities to to do so." Please share your college tour experiences with us. What are your most important questions? Scheduling College Tours? Begin With Basic Questions. 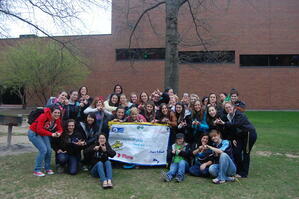 The 25th annual National Service-Learning Conference will be held in Washington, D.C. this year from April 9-12. This conference invites educators and students from across the nation to attend workshops, hear keynote speakers, and engage in service. The event brings together civically engaged young people to share the impact of service-learning and volunteerism. This year the conference will focus on teaching leadership, advocating for service-learning on Capitol Hill, and service opportunities across the globe. One of the conference presenters is Brenda Elliott-Johnson, the Executive Director of Student Services and Character Development for Guilford County Schools and 2014 recipient of the G. Bernard Gill Urban Service-Learning Award. I sat down with Elliott-Johnson to learn how a successful service-learning program is started in schools and to learn how service-learning can serve as a tool for educators. Natasha: How did you become involved in service-learning. Where did it all start? Elliott-Johnson: I started with service-learning as a teacher, and so that would have been almost twenty years ago. I just really tried to figure out ways to take what students were learning in school to some real world examples. Students are always asking, “when will I ever use this,” and so service-learning, for me as an educator, has always answered that question by giving them opportunities to solve problems. In Nashville I was still really involved a lot of organizations. I was a Student Council sponsor at my high school. I was involved in a program which helps young people think of ways to address bias, bigotry, and discrimination. We had a lot different ways that we were helping young people solve community problems. I was a science teacher and we had a group of young people—I taught at a predominantly African American school—and there was a concern about the lack of African Americans going into the field of science. Our students developed a website to promote African American students into the fields of science by highlighting local people who were working in those different areas. As a principal, I also served on a number of community boards including a Youth Holding Power project that I helped to sponsor, which was a national project that had youth leading school reform efforts, and a Youth Impact Project. Natasha: You’ve won an award and you will be attending the National Service-Learning Conference. Can you tell me a little about that? Elliott-Johnson: The National Youth Leadership Council holds an annual National Service-Learning Conference, which bring together students, teachers, and researchers in the field of service-learning. This is our third year, as a school district, to participate. The last three years we have been able to bring students so they can see what other students are doing around the country in the field of service-learning, as well as share our practices and learn about other opportunities for service-learning. We are glad to be able to do that this year. It’s going to be a big deal, and one of the events includes is a visit to our elected officials – to actually go on Capitol Hill and talk about the importance of this type of learning. Natasha: Can you tell me about the evolution of service-learning here in Guilford County? Elliott-Johnson: Our superintendent, when he came in 2008, did listening tours around the city. What he heard over and over again was that something was missing from the education of our students. Whether he talked to parents, students, community, or teachers, they all said the same thing. They felt that it was character—that our students needed to have good character and they also needed to make a positive difference in their community, not just when they graduated. So out of that came our district’s Character Development Service-Learning Initiative, back in 2008. Our original goal was to expand character development and service-learning district-wide. We’ve had some tremendous work happen, including in the last three years for our high school seniors to document more than 600,000 hours of service and more than 2000 of our graduates to earn service-learning recognition. We have a lot of youth that are engaged. More than 10,000 have been engaged in service-learning in communities and schools. I’m just so excited about it. We’re just beginning to measure the footprint that our youth are leaving in our community: that 600,000 hours is more than a $14 million impact. They [youth] have a lot of innovativeness that we could benefit from as a community. To clarify, students in Guilford County School’s service-learning program can earn recognition for their service in two forms. They can earn an Exemplary Award by tracking at least 100 hours of service-learning using NobleHour, or they can earn a Service-Learning Diploma by completing at least 250 hours of service-learning. To keep track of all the hours students complete for their service-learning recognitions, Guilford County schools turned to NobleHour to help make this process easier and more efficient. As Brenda explains, to fulfill the superintendent’s vision of service-learning “…we had to find a system that we could easily use to capture these hours. We looked at a lot of different products, and NobleHour seemed to be the one that really stood out for us and has helped us to be able to capture that data.” The impact of these hours is changing the lives of students and community members. Educators in Guilford County have started a successful service-learning program that is growing and taking learning beyond the classrooms and into the real world. In part two of our series on college visits, we discuss how to decide which schools to visit and when to schedule tours. walking into kindergarten and the sweet little girl who used to wear pigtails are in the final stages of determining where to go to college. Yes, college. You’re ready now. You can do this. It’s time to start the college tours. While it might be easy for you as a parent to just handle it and schedule a few visits, it’s important your student is involved in the process. Before you begin booking flights or packing up the car, have your student do a little legwork. Have a discussion with your child. Talk about parameters. Do they want to go to a school in a big city or something more suburban or rural? Does the size of the campus matter? Consider categories – SEC versus Big Ten, small private school versus big state school, religious versus secular. Does your daughter want to go out of state? Talk about regions of the country. Does your son want to be on the west coast or the east coast, south or north? Does your student have a specific major in mind? Do they want to play sports or have a particular talent – theater, dance, music? If you’re lucky, you might get something more than, “I don’t know.” My friend’s daughter has grown up in a very urban environment. She’s decided she wants to experience a more rural campus. We live in the Midwest. My son’s one major requirement is to be someplace warm! Keep asking questions to narrow down the list. Have your child review college guidebooks and online sources like Fiske, Princeton Review, Barron’s, or U.S. News and World Report. It’s also a good idea to talk to your child’s high school counselor before you visit schools. This person should know something about your student and could offer suggestions about which schools to consider. The counselor may also personally know college admission representatives or put you in touch with recent high school alums at different universities. Another resource that may appeal to your savvy social media student is to have them check out the Facebook pages, Twitter accounts or other forms of social media used by the universities that interest them. As your child begins his research, encourage him or her to highlight 10-20 schools. Some kids may choose more, others far less. It’s just to get them thinking about where they want to go and to take ownership of their future. Once they have their picks, ask them why the schools are on the list. Be prepared for some lame answers, but keep digging. Maybe it’s the location. Maybe it’s the courses they offer. Maybe it’s because the football team won the national championship. Or, possibly, it’s because it’s the furthest school from you and all these questions! McKnight said visiting the schools solidified her interest in William & Mary in Virginia, and Dartmouth in New Hampshire. It also sparked an interest in Emory University in Georgia. Stuckey said once they narrowed it down, she then looked at universities located in cities allowing flexible travel arrangements. They looked at cities with major airports, non-stop flights, or areas where they could visit more than one college in one trip. Also, if they had to fly, they committed to visiting at least two schools to make the trip more cost-effective. “We tried to travel when the kids were off school and took advantage of times when other high school students were in school.” Being from New Orleans, Stuckey used the Mardi Gras break to visit schools. While it may be convenient to schedule tours during holiday and summer breaks, it doesn’t always give you a true picture of the campus. “It is also nice to visit the college or university during the academic year, when school is in session, to get a true sense of the campus atmosphere,” said Kammerer. Another option to maximize time and minimize out-of-town expense is to wait for acceptance letters to help determine which schools to visit. “We visited schools that we didn’t get a chance to see initially and also did some second visits to help make decisions,” said Stuckey. “Planning a visit may vary from institution to institution, but many universities including UC San Diego offer an online registration site that allows visitors to schedule their campus tour,” said Kammerer. Stuckey said almost all schools have a “Plan Your Visit” section on their websites with information about flights, travel agencies, car rentals, and lodging. Always ask if they offer discounts for college visits. Many schools have open house events with tours, presentations, etc. You can check each school’s website in their admission section for dates and information about attending those events or to schedule individual tours. Tours are offered throughout the week and sometimes on Saturdays. Depending on the university, you may be able to sit in on a class, visit professors, meet coaches or visit with students. “At Emory, my tour allowed me to get in contact with the dean of admissions, which definitely impacted how I viewed the school,” said McKnight. “Most times when a student is closer to making up their mind about attending a particular school, it is recommended that the student revisit if possible and perhaps stay overnight to get a more robust experience,” said Charles Basden, Jr., coordinator, special projects, for George Washington University, a member of the NobleHour Network. Basden also suggests inquiring about potential special situation funds universities may have to help assist families with their effort to visit campus. Stuckey advises staying as close to campus as possible. It’s a great way to learn more about the community. When I visited LSU with my son, we stayed at the Cook Hotel right on campus. We could walk through the university grounds, meet and speak with students along the way and we were able to get a feel for campus life. Also, when making travel arrangements, consider arriving on campus early or staying a few hours after the tour. There’s nothing worse than missing a casual opportunity to visit with students, professors, financial aid representatives, or admission counselors because you have to rush off to catch a flight. Remember, if it’s a group tour, there will be other parents who want to meet with university staff also. Be prepared to wait. Have a cup of coffee at the local café or the bookstore. Grab lunch in the dining hall or dinner at a favorite university hangout. Walk around campus on your own. It’s a great opportunity to speak with students and ask them questions about school. 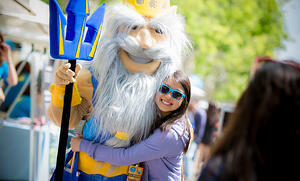 “Kids get a strong feeling about the campus and the people they meet on campus,” said Stuckey. Next time - Part III - Going on Tour and questions, lots of questions! Thank you for joining us for another “Empowering NobleLeaders” Blog with Dr. Kristin Joos and Liz Harlan. Reflection in life, especially when positive, is almost always beneficial. The act of reflection can increase feelings of self-perception personal purpose, and community awareness, as well as increase understanding as to one's role in the greater community. We would like to share with you the importance of reflection on service experiences and offer some insight for both faculty and students on how to do service reflections. While a student is volunteering, the service experience can become more meaningful through constant questioning of motivations, asking why one is helping, and keeping those ideas at the forefront of their mind. A student may maintain their motivation to help by keeping track of both the work they do, as well as their initial and ongoing reactions to their service activities. Reflection before, during, and after a service experience is key, to set goals, and to remember and document observations, emotions, and activities. The most important reflection may come after when the student connects their individual experience to the bigger picture, whether it’s a wider community or national/international issue, cultural or environmental cause, or institutional motive. With reflection and further research, a student will gain deeper understanding of oneself, their community, and society. The more one reflects on their volunteer experiences, the more one knows what they like, dislike, and can identify personal strengths. 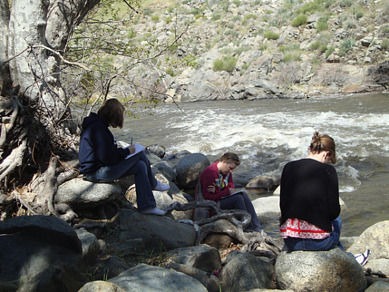 Additionally, students can then use their service reflections to decide how to channel their experiences into greater action or next steps, which can be beneficial both for the individual (e.g., explore new passions or possible career choices) and the community (e.g., organizing one river clean-up to be an ongoing project with other students and community members in the area). For students volunteering, it’s easy to get lost in the day-to-day routine. As you begin to look back on your work, here are some helpful ways to take stock and connect to the bigger picture. What? So what? and Now what? These questions are commonly paired with community service to help participants think about how to channel their experiences into action or next steps. Answer them on your own or with other volunteers. How would you describe the actual work you’ve been doing? What different types of situations have you been involved in and learned from? Whether it’s playing with kids or talking to an elderly person or filing hospital records, describe your day-to-day work. What did these actions mean? Who did they impact? How did they impact you? How did they affect the community you worked with? How did they contribute to the larger impact your organization (or you) is making? Now that you’ve done your service, what are you going to do next? Are there other channels of involvement? What else would you like to know about your site or issue? How will you take this experience and put it to use helping others? What ripple effect will your experiences make for yourself and others? Reflection is a key component of service learning in and out of the classroom. It can be accomplished in many different avenues that students can choose for themselves to fit their learning and creative styles. Encourage students to explore these styles and decide how they would like to record and reflect on their volunteer experience. Each time a student volunteers, it is beneficial to take a few minutes to make notes about what they did, what they learned, and how the experience impacted them. These notes will be useful for future reflecting on experiences as well as for possible use in creating a final presentation for a class. NobleHour has an work reflection tool for students exactly for this purpose. Engaging in conversation with others (e.g., friends, professors, family) to explain what the student has been doing and why it is important to them is another way to reflect. With a volunteer supervisor’s permission, a student may be able to take photos and document their adventures in service (there may be strict rules requiring permission and releases) and use these visuals later for reflection and sharing. NobleHour enables students to share their photos, videos, and reflections using the Contribute and Share tool. One of the main goals of service learning is that students will continue or expand upon their community service even after the final project is done. If students are interested in learning more about their cause or organization, people at the volunteer site are great resources for other contacts and groups that are doing similar work and organizing similar events. To maximize the service learning curriculum, components of reflection throughout the semester for students should be interspersed in the syllabus. Class discussion, journal entry writing, online posts, article critiques on surrounding service topics, and a final demonstration or project of the students’ volunteer experiences are wonderful and diverse ways to get students engaged and thinking about their experiences. Teachers can guide students' reflection processes in a variety of ways, including, but not limited to: discussion, role play, and journaling. Place experience in a larger contect. Encourage comments from partners and recipients. To fulfill one of her global health minor requirements in college, Liz took a course called Core Issues in Global Health: Community Health Practice for Refugees. The professor employed a Community Based Service Learning syllabus guideline which included student-led discussions, lectures, presentations, several community guest speakers, papers, posters, and a community engagement project. The class concluded with each student creating a material (paper, art, video, or article) that described their community refugee experience and also would benefit the organization. The professor made it a class requirement to get out into the surrounding community and see for themselves the information they learned about. Liz's work as an after school tutor with Fugee’s Family outside of Emory every week for one semester created meaning for the statistics and health disparities they were learning about for refugee populations in America. She is now able to look back over her paper and final project, and remember how engaged she felt both in class and with the young refugee soccer players at the Fugee’s school house. Service learning and service reflections are valuable student and teacher tools and provide numerous opportunities for personal growth and community service. The more these ideas and actions are incorporated into classrooms, from K-12 to higher education, the better students, communities, and the world will be. Tune in next time for a discussion of the power of volunteering in diverse environments and with diverse people. with spring break on the horizon, and summer beyond that, now is a good time for all high school students to start planning those college visits. In this three part series, we’ll provide some guidelines and tips to make the most of your student’s college visits. We’ll start with an expert – a mom. 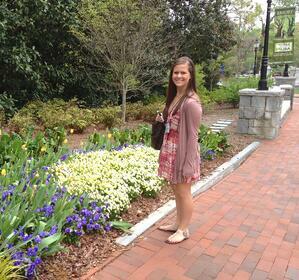 Terri Stuckey is no stranger to college visits. With a junior at Emory, a freshman at the University of Virginia and a junior in high school, she’s as close to an expert as they come. Stuckey has visited at least 26 schools, some of them twice, and she’s not done yet. Don’t let those numbers overwhelm you. Not all visits require airfare or lodgings or days away from school and work. One of the easiest places to start your journey is your local university. Even if your son or daughter is adamant about going away, this is a great place to begin. It doesn’t matter if they want to go to that particular school. Visiting different colleges lets students determine what they like and dislike. It’s just as important to take note of why they don’t want to go to a specific school. These visits can be done on days off from school, after school or on a weekend. You can get a feel for the whole tour experience. This will help you gauge time for itineraries later if you decide to tour schools out-of-state. In addition, attending local events on a college campus can give your son or daughter perspective and get them excited about the admission process. 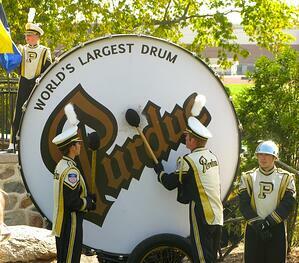 Catch a show put on by the theater department or cheer on the local team during a football game. If you’ve already planned your Spring Break vacation, find out if there’s a university near your destination. If you have the time, take a side-trip and schedule a tour. Have lunch or dinner on campus. Walk through and visit the bookstore or if you’re short on time, just drive through the university. Again, it’s a good starting point just to see what’s out there and to give them a point of comparison. Just about every university my family visited was during a vacation. Road trips through the south brought us to the University of Alabama, Ole Miss, Tulane, LSU, Loyola, and the University of Miami. My boys are two years apart. I made sure the younger one was paying attention. Even their sister, five years younger, has fond memories of our campus visits. It doesn’t necessarily have to be an academic camp. The point is to give them the experience of being on their own away from home, family and friends. It also provides them with the opportunity to live in a dorm. “Before you start looking at colleges all over the country, see if they can survive a week alone,” said Stuckey. If they don’t enjoy the experience, then it helps narrow things down. It may not be worth it to visit universities more than a few hours away. It’s best to sign up as early as possible. Deadlines can be as early as March. Just search “college summer programs for high school students” and you’ll get a variety of listings. You can also check with your high school college counselors as they may have information about summer programs too. 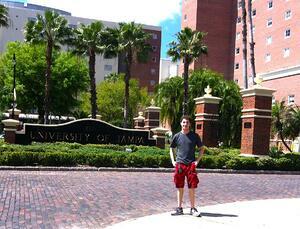 There are also companies that coordinate tours of multiple universities in specific regions. This takes the hassle out of the planning and lets you concentrate on the school visits. other and it’s hard to keep straight.” She recommends taking lots of pictures, especially by specific landmarks and school signs so when you get back home they can help you remember the campus. Obviously, not everyone can afford the time or money to visit every school. Fortunately, the Internet and social media are great resources to learn about schools in the comfort of your own home. Every university has a website. Some offer virtual tours. You can also check out their Facebook page and mobile apps, as well as Twitter, YouTube and LinkedIn accounts. Students often post videos of school events, tours of dorms, etc., and many student groups have their own Facebook page. In addition, Basden recommends reaching out to current students or faculty members through the directory or through student organizations to get a better sense of what campus life is about. Chatting with recent alumni can also provide a helpful perspective. The evolution of online learning poses many questions about the future of education. Is online learning effective? Do online courses provide the same quality of education as traditional classrooms? Will online classes someday make classroom teachers obsolete? Like many innovations in the digital world, online learning is constantly being reviewed and modified. But I don’t feel that online education is a threat to the traditional classroom. Rather, it is another way the Internet spreads ideas, creates opportunity, and facilitates connectivity between people. in the mail and I received my username and password, I knew little about formal writing. However, by the end of the course I had learned basic structure, techniques, and editing tools that compelled me to continue improving my writing. I learned more from this class than any other English course I had taken in school. Because I enjoyed it so much, the following semester, I signed up for a second writing course in the program. These courses challenged me not only in my writing but also in becoming an independent learner. In both cases, I acquired knowledge and skills related to my writing, and I also gained experience in time management, a strong work ethic, and practice in adaptability as a student by facing a different form of learning. However, not all online classes are created equally. A couple years later, I signed up for a summer math course to earn an additional math credit. The program for this course was different, and I did not enjoy learning the material. The course consisted of reading the material and answering questions about it. I finished the course with good grades, but I did not feel that I had personally gained anything from this experience. The difference in this course was that it lacked the feeling of a regular classroom. In the writing courses I took, my instructor communicated regularly with me, continuously provided feedback, and engaged in live chat conversations with the class. I also interacted with my fellow students in class discussions and peer review. However, in the less enjoyable math course, a lack in human interaction with my teacher made the class unrewarding. My experience is not a critique of any particular course, but rather an insight into the nature of quality online education. For online courses to truly benefit students there must be a seamless liaison between teacher and student. In my opinion, the only significant difference between a successful online course and a traditional one is that the teacher and pupils are in different rooms. Online courses should facilitate typical class discussion, lessons, and feedback. A popular format for online learning is the readily available Massive Open Online Course (MOOC). MOOCs are free online course accessible by anyone, unique for their unlimited enrolment. In a typical MOOC, a professor will upload a video of the lecture, reading materials, practice problems, and assignments comparable to those the professor would provide in the course he or she teaches. 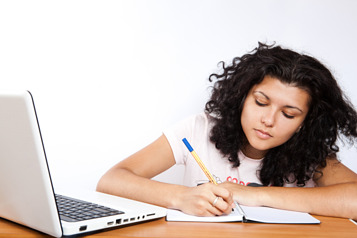 A computer typically grades assignments, and completion of the course does not usually entail university credit. In 2012, MOOCs gained attention when Ivy League universities began uploading full courses free of cost to the public. Some popular MOOC websites include Udacity, edX, and Coursera. The spirit of MOOCs is one of equality in education—the idea that wider access to higher education promotes connectivity, collaboration, and equal opportunity. MOOCs were developed to solve the problem of higher education by making it available to anyone at little to no cost. However, they are still young and not as fool-proof as they seem. The challenges educators face in achieving the accessibility and quality of learning that MOOCs attempt to provide represent the evolving state of online education. MOOCs are often less successful than anticipated by their creators because the unlimited enrolment of the course means little human interaction between the student and the instructor. The instructor merely provides lectures and materials, but learning the content is left up to the student. Educators find that the students most successful in these types of courses are already high-achieving, educated, motivated students. MOOC developers and professors originally envisioned the MOOC as a way to bridge the education gap by making higher education accessible and affordable, but this has not been the case. Millions of dollars have been invested into MOOCs. Millions of students enroll, but only a fraction actually complete the course. MOOCs’ shortcomings are partially due to the lack of human connection between the teacher and the student. Without the ability to personally engage with an instructor students often find their experience with MOOCs to be less enriching than they had expected. Instead, MOOCs often prove mechanistic and unfulfilling. The teacher simply is irreplaceable in the classroom. MOOCs remain an experimental area of online education, and perhaps someday they will become a pathway for a universally accessible higher education experience. For the time being though, the mishaps of the MOOC show that quality education to the masses cannot be achieved without investment in the human connection between teacher and student. The future of online education is exciting. It presents the opportunity for wider access to higher education. However, online courses cannot supplement traditional classrooms without considering the latter’s experience. For an online course to be comparable to a conventional classroom, the student’s learning experience must be one that mimics the ways in which teachers bring out students’ potential. They’re BACK! Our college students are home for winter break and they’ve brought a lot of baggage with them! Enjoy that first great big smile of recognition at the airport, followed by a wonderful hug and kiss. They’ve come home with their bags stuffed, including a few non-tangibles – that new-found sense of independence, an “air” of maturity peppered with attitude, a new curfew time, and of course at least two loads of dirty clothes! The first 24 hours are the best for me, but do they really need four to five weeks off for the holidays? I mean, even my husband only gets the week off between Christmas and New Year’s and I think that’s very generous. High school and elementary school students go back right after New Year's. So what am I going to do with two college students till mid-January? Get them up and out of the house before noon to share some of that youthful energy helping others. Many organizations are looking for extra help during the holidays. Whether it’s collecting food for shelters or helping serve holiday meals to the homeless, have your college or high school student take a break from texting, shopping, hanging out, or playing video games and spread some holiday cheer. Start with your own city’s website. In Chicago, the city’s service initiative is called One Good Deed Chicago. The program lists opportunities to volunteer and support the diverse non-profits in the city. Has your student put on the freshman 15? Sign them up to help shovel snow for the elderly for a great workout! New York City’s service website has hundreds of listings including tutoring, serving meals at shelters, and teaching seniors about the Internet. In addition to city and state government websites, you can also check out your local chapters of the United Way, YMCA, and the Salvation Army. The Salvation Army in Williamsburg, Virginia, needs bell ringers through December 24. To quote Buddy the Elf – “The best way to spread Christmas cheer is singing loud for all to hear!” According to their website, volunteers can sing carols, play an instrument, and of course ring a bell! In the midst of all the commercialism, your good-hearted son or daughter can remind others to share and care about people in their community. If it's too cold to ring the bell outside, you can also create your own virtual red kettle fundraiser! The Greater Chicago Area, Northern Illinois and Northwestern Indiana Division of the Salvation Army also offers mobile alerts to let you know about opportunities to help in your area. Make sure to also check out some amazing volunteer opportunities listed on the NobleHour website. There are thousands of listings all over the United States, ranging from visiting nursing homes, volunteering at schools, or sorting and packaging food at local food banks. Find the true meaning of the holidays by getting your student excited about serving others. If your son or daughter just wants to nest and watch every old holiday movie during their college break, then get those idle hands working. Even someone with all thumbs can make a no-sew fleece blanket! Blankets can be donated to local homeless shelters or you can contact your local chapter of Project Linus, a non-profit organization that provides homemade blankets to children in need. Their website provides a variety of patterns including quilts and afghans. 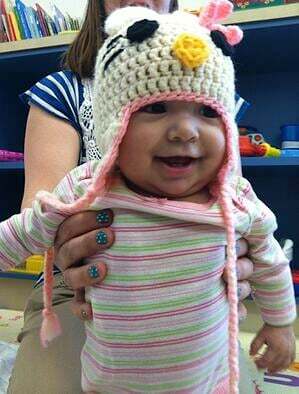 If you and your child like to knit, spend some quiet, quality time together knitting caps for cancer patients. Knots of Love donates caps to men and women who have lost their hair due to chemotherapy treatment, burn accidents, brain surgery and head trauma patients, as well as individuals with alopecia. At the point where you can’t take your college student acting like a guest in his own home anymore, it’s time to call in the big guns – grandma and grandpa! A little quality time with them will make everyone happier! Boost their ego by asking them to help their grandparents with a few technology lessons. DoSomething.org’s Grandparents Gone Wired campaign encourages young adults to use their online skills to help seniors get connected. Spend some time with gramps setting up a twitter account, or show grandma how to use Facetime and Facebook on her cell phone and laptop! Call your local nursing home to see if you can help residents there too. The campaign runs through January 21, and also offers an opportunity to win a $10,000 scholarship! The time spent together is a priceless gift. 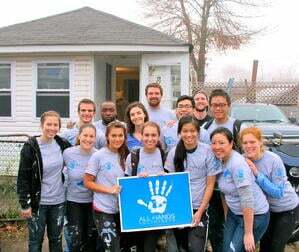 Visit the All Hands Volunteers website to complete an application, as well as determine available dates. The organization provides three simple meals, basic accommodations, and basic logistics to ensure a positive and productive experience. 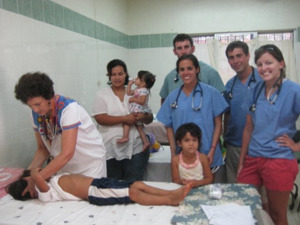 Volunteers must cover their own travel expenses and meals on days off. The organization has a strict minimum age policy and cannot accept volunteers under the age of 15 (14 in the Philippines). All 16 and 17 year olds must be accompanied with a responsible adult. There is no minimum or maximum time commitment, and the organization does not charge a participation fee. Volunteers can come for a day or a couple of months. The organization wants to make it as easy as possible for people to volunteer and make a difference. So, before you know it, you’ll be sending your son or daughter back to school with a duffel bag filled with clean laundry. While you’ll be happy to get back to your quiet routine, you’ll might also be counting the days until Spring Break! Don’t worry, we’ll come up with a few ideas to help you then too! Photos courtesy of Knots of Love and All Hands Volunteers. It’s that time of year. Seems like there are multiple parties every week between now and New Year’s Day. Cookie exchanges, office parties, tree trimming parties, ugly holiday sweater parties, neighborhood get-togethers, family events, New Year’s Eve and don’t forget Festivus for the Rest of Us! ‘Tis the season to be jolly and spread good cheer with friends and family, but how about your community? This year why not have a holiday party with a purpose – one that shares good will to all men, women and children? Let’s face it. While we may love getting gifts, we really don’t need one more candle, another box of candy, or a tin of popcorn. As the saying goes – it’s better to give than to receive. So in the spirit of the season, here are six simple ideas to truly enhance your holiday parties. 1. Instead of Secret Santa, collect new pajamas and books. 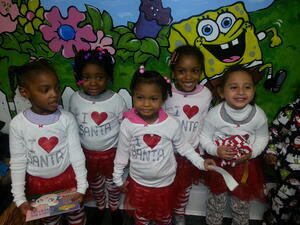 The Pajama Program provides new pajamas and new books to children in need. Millions of children live in poverty and don’t know the comfort and security of a simple bedtime ritual. Many live in group homes or temporary shelters and have never even owned a pair of pajamas. Contact the Pajama Program or a local chapter to determine their needs and where to send your donations. Ask your guests to skip the hostess gift and bring new pj’s and books to your party instead. Want to do more? You can also volunteer to read to children at one of their reading centers or help sort donations. 2. Collect jeans for homeless teenagers. This is a great project for middle school, high school and college students. In 2008, DoSomething.org® partnered with Aéropostale to create Teens for Jeans. 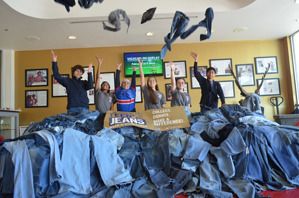 Similar to food drives, teens collect new and gently used jeans to donate to homeless youth. Over a million young people under the age of 18 experience homelessness in the US every year. “We called homeless shelters across the country and asked them what young people entering homeless shelters often requested and found that jeans were one of the most requested items,” said Nami Mody, Homelessness and Poverty Campaign Specialist for DoSomething.org. You can collect jeans now during the holidays and drop them off at local Aéropostale (and P.S. from Aéropostale) stores from January 12 to February 15, 2015. Each store is paired with at least one homeless shelter or charity in your community. Jeans of all sizes are needed and should be in good condition. 3. Chances are someone in your family or circle of friends will find a new cell phone under the tree this Christmas. You may even have a few old cell phones in your “junk” drawer. Now you can put them to good use. Instead of exchanging ornaments at your holiday party, tell your friends to bring their old cell phones! Cell Phones for Survivors encourages people to donate their old phones to be refurbished, sold, and turned into funds to help survivors of domestic violence. Simply collect and mail in old cell phones. Sign up at Do Something.org and print out postage paid shipping labels. HopeLine® from Verizon is another similar program. Since 1995, Verizon has refurbished phones and equipped them with minutes, texting capabilities, and a variety of services before giving them to survivors affiliated with participating domestic violence agencies. Phones can be from any provider. Drop off donated phones at local Verizon stores or ship with their postage paid shipping label. 4. Whether you’re in charge of the office party or planning the end of year club or team celebration, share your joy with others who need your support. Find all those holiday greeting cards you keep buying on sale and never send out or create your own. Ask your guests to send Season’s Greetings to military personnel away from home and family. Or, send cards to your local nursing home, children’s hospital, or shelter, etc. Every year, Operation Gratitude sends over 100,000 care packages filled with treats and letters to deployed U.S. Service members, their family members, and wounded soldiers. See their website for specific details about what to write and where to send your cards. A MillionThanks.org asks individuals and groups to write cards and letters of appreciation for the military. Review their guidelines, find a location near you, and send your cards and letters to our troops. Contact your location via phone or email to be sure they can accept your cards and letters. 5. If you’re having a cookie exchange, ask your guests to also bring an extra pair of gloves, socks, a hat or some basic toiletries. When dividing the cookies, assemble extra bags for your local homeless shelter. Fill reusable grocery bags or old backpacks with items like toothbrushes, toothpaste, soap, shampoo, deodorant, and hand sanitizer, etc. This is a great way to use all those little hotel shampoo and body wash bottles! You can also find hand warmers in the dollar section of many stores. Don’t forget to add the cookies! 6. This season brings a lot of celebrations filled with our favorite dishes, treats, and traditions. What are yours? If you’re getting together with family and friends to bake or cook your special recipes, have everyone bring duplicate non-perishable items for your Thanksgiving, Christmas, or New Year’s Day dinners and donate them to a local food bank. Or, check with your local church to sponsor a family in need. Collect items they might need to brighten their holiday. You can also stop by your post office to pick up Letters to Santa. Help bring joy to children around the U.S. Whether you're celebrating with family, friends or co-workers, give thanks for what is truly important. Remember to share your joy with your community and those in need. How do you celebrate this season of giving? Tell us what you do as a family, with friends and with your community. The holidays are upon us. As we approach the days of festive get-togethers, parties, and dinners, we sometimes complain that we overindulge. However, according to the United States Department of Agriculture (USDA), shockingly there are approximately 49 million people in the United States, including nearly 16 million children, who live at risk of hunger everyday. According to the Greater Chicago Food Depository (GCFD), the faces of hunger are changing. Often those in need are employed, are veterans, children, and seniors. In Cook County alone, the numbers are startling. Nearly 800,000 people are unsure of when they will receive their next meal. One in six Chicagoans faces hunger every day. Last year, the Food Depository distributed 67 million pounds food, the equivalent of 154,000 meals every day. It is getting harder for families to make ends meet. Some are skipping meals or cutting back on the quality or quantity of food they purchase. In fact, the GCFD reports 47% of households say they have to choose between paying for food and utilities, while another 44% report choosing between paying for food and rent or mortgage. This time of year, there’s a big push to increase food donations for the holidays. Students in elementary and high schools, as well as universities throughout the country are coming together to collect thousands and thousands of pounds of non-perishable items. In Chicago, the NBA Bulls, along with sponsors Vienna Beef and Midway Moving and Storage, hosted a number of food drives, including a contest for Chicago Public Schools. Over 35,000 pounds of food was collected to benefit the Greater Chicago Food Depository. The winning school, Phillip Murray Elementary Language Academy, collected over 4,000 pounds of food. Area food pantries, shelters and soup kitchens rely heavily on the GCFD. Their campaign, No One Should Go Hungry is a simple, yet powerful message, highlighting the fact they have just 1 Goal, 1 Mission - To Fight Hunger 1 Dollar, 1 Meal, 1 Person at a Time, until the day that no one goes hungry. The One City, One Food Drive goal is to collect one million pounds of food. Food depositories cannot accomplish their goals alone. They need active volunteers of all ages to help in their mission. At the GCFD, volunteers are always needed to load trucks, pick up and deliver produce, check orders, help out with special events, and help pick up and deliver donations from food shows. They can also volunteer at member pantries or soup kitchens. While students are home for break or off for the holidays, a great community service activity is to volunteer at the food depository. School groups, service clubs, and individuals can help repack bulk food products into individual/family sizes. The food depository posts their volunteer schedule four months in advance so groups can plan ahead to sign up. Participants must be at least 14. If you want to get your children involved at an early age, younger kids can participate on special “kids days” with adult supervision. Feeding America, a leading domestic hunger-relief charity, works to feed the country’s hungry through a nationwide network of member food banks. In addition, the organization encourages community engagement running a number of partner promotions, and by using social media in a variety of ways. One unique option is to be a virtual volunteer. Students can "spread the word" and promote social good and awareness through Facebook, Twitter, Pinterest, Instagram, Google+, and YouTube. In keeping with the virtual theme, today’s tech savvy kids and young adults, can also host virtual food drives. Whether your son or daughter needs to complete a community service project or their club wants to highlight their community engagement, the Virtual Food Drive is simple to coordinate and through the use of social media, students create awareness about the issue of hunger, as well as raise funds to support Feeding America. Just set a fundraising goal, create a page by answering a few simple questions and ask others to donate using the online tools provided. The virtual food drive is a great way for colleges to get their students involved. For the seventh year in a row, California State University and UC San Diego students participated in the "Colleges Rock Hunger" food drive to gather money and food donations for needy families. Both universities used virtual food drives, along with traditional methods of collecting food. Last year, students donated nearly 245,000 pounds of food to the Jacobs & Cushman San Diego Food Bank. This year the food bank distributed 22.3 million pounds of food to San Diego County, the equivalent of 18.6 million meals. The food drive was a great way for students to give back to the community and make a difference. Even college students can afford one can of food or a $1 donation. The California students creatively worked with different groups on campus to encourage everyone to participate. They also maximized their efforts with existing events, like homecoming, and gave students incentives for participating like “cut the line" for free food, giveaways, preferred seating, or immediate access to games and activities. In addition, student organizers reached out to the local business community for support. If you prefer the traditional hands-on route of volunteering, Feeding America encourages volunteers to check out local community service opportunities. There are food banks in just about every city in America. The Feeding America website offers a nationwide food bank locator. You can search by zip code or state to find the nearest food bank. In addition to helping local food banks repackage donated food for use at food pantries, and transporting food to charitable agencies, you can also help tutor young children at their local Kids Café programs. Another great way for students to support Feeding America's efforts this holiday season is to give a donation in someone's name. It's a great gift for that hard to buy for relative, friend or teacher! The Bank of America Give A Meal program runs through December 31. The online campaign has resulted in more than 100 million meals for families and individuals in need across the country with over 40 million meals coming in just through last year’s program. For every $1 donated through Give A Meal, the Bank of America Charitable Foundation will give $2 more, up to $1.5 million - giving donors the opportunity to triple their impact! As we’ve witnessed recently, disaster can strike without rhyme or reason. Feeding America also needs volunteers across the country to support survivors of disaster-affected communities. Sort, box, and repackage donated food to be directed where it's needed most. Whether it’s a virtual food drive or a traditional one, students have the power to make a difference. This holiday season, get involved and support your local food bank. What do you do as a family to help with the fight against hunger? 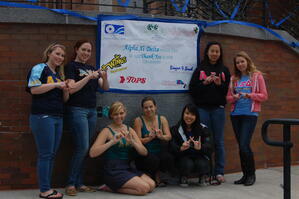 Check out our recent blog about how service learning can help you run a successful food drive! How do kids begin the process of choosing a college major? For some it’s an easy decision. Often, it starts with a specific interest or maybe they are exceptional in a particular subject. I remember in high school completing some sort of career questionnaire. It said my interests would align with communications or public relations. I figured, great! I like people and I like to talk. For me, communications was a great fit, but looking back, I do wish I had done more research about career paths for my major. Kids today have access to so much more information. College majors seem more defined and specialized now. When I went to college, I went in thinking I had at least two years to figure out my major. 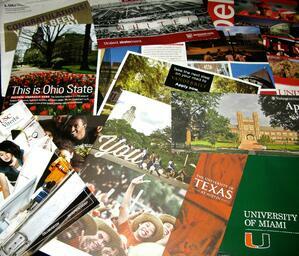 Many students now declare their major during the college admissions process. But how does an 18 year old really know what they want to do? How do they figure out all the potential careers one major can offer? One way to help them figure it out is to volunteer. Community engagement can provide high school and college students with an opportunity to explore their interests or try something new. “Kids who do community service see how they can apply their skills in different areas,” said Dan Van Dyke, a high school counselor for De La Salle Institute in Chicago, IL. Van Dyke said when he asks students why they want to pursue a specific major; they usually reply that they are good in that subject. For example, a student good in Math wants to study Engineering, but he may not look further than the obvious career path. They don’t think about all the different options for their particular set of skills. Many students just don’t want to do the research. For Allison and Sally-Rose Cragin, volunteering has always been a family affair. Their mom, Louise, instilled a love of helping others at an early age by encouraging them to volunteer at Krewe de Camp, an annual, one-week camp for children with special needs in Covington, Louisiana. 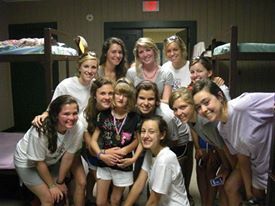 Sally-Rose’s decision to pursue her major was also a direct result of her experiences volunteering at Krewe de Camp. She is a junior at Rochester Institute of Technology studying American Sign Language Interpreter Education. Sally-Rose said her favorite part of high school was the community service work she was able to do during high school with Boys Hope Girls Hope of New Orleans and summer camps like Camp Sertoma and Meadowood Springs Speech and Hearing Camp. What are your children’s interests? Are they volunteering in areas they want to study in college? Not sure where to start, check out our guide to volunteering.